A few days ago this blog wrote about the fairly nearby star Betelgeuse and how it might be approaching supernova. Want to know how honkin' powerful that blast could become? On the right is a recent photo of the galaxy UGC 12682. It's 70 million light years away from the Earth. 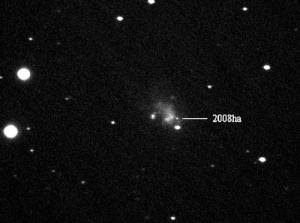 And prominently labeled (as if it even needed it) is the newly-found supernova SN 2008ha. 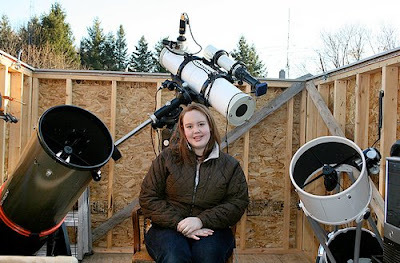 It was found by 14-year old Caroline Moore of Warwick, New York and a member of the Puckett Observatory Supernova Search team. Despite its vast distance, Supernova SN 2008ha is still 25 million times brighter than our own Sun. So try to imagine something that bright, only a mere 600 light years away. And it's thought that the progenitor star of SN 2008ha wasn't even all that massive to begin with: many astronomers are saying that dear Miss Moore has discovered one of the most peculiar supernovae to have ever detected. Hit here for much more information about Carolina Moore and SN 2008ha.